When you are building tables for your house, you need to be certain that they match your home style and theme colour, even down to the legs. Otherwise, the tables may wind up being eyesores rather than valuable additions to your furnishings. In fact, the legs can dictate the style of the entire table in some instances. For example, the retro legs make the tables vintage-style or eclectic and not modern. Refer to our information below to learn how our company can help you receive the legs that are ideal for your tables. When you rely on our company, you will be able to select from a wide assortment of leg shapes. We offer ball, cylindrical, cone and rectangular legs along with uniquely shaped ones. The type of table will dictate the height and style of the legs that you will require for it. While a dining room table requires long legs, coffee and end tables most often need short, stocky legs. Of course, there are other types of tables besides our examples. Keep the use of the table in mind to select the table legs that will match your home style and theme colour. Our smooth, sleek legs of geometric shapes complement the modern style in an ideal way. The wood legs with ridges or grooves in them that we offer lean toward the traditional style of decor. Along with these characteristics, you will need to consider the finishes of the legs, and we discuss these in the next section. On top of the various shapes of legs that we offer, we provide the legs in a wide assortment of finishes. 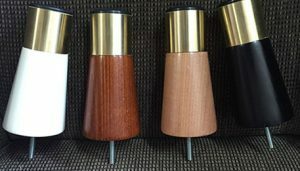 You can purchase unfinished wood legs to stain or paint on your own and stained wood legs in black or shades of brown along with chrome, alloy, aluminium and stainless steel legs. The retro ones have a combination of wood and metal. When your home is in the modern style the metal finishes that we carry complement this style in an ideal fashion. If your home is traditional or rustic, though, you need to turn to the wood legs in black or shades of brown. Remember to select the colour that complements your theme colour in a pleasant manner. Consult with our company, Peter Ross Enterprises, or browse through our website to learn further details about table leg ideas that will match your home style and theme colour. We even allow you to customise the height of your legs with certain styles. All products come with a guarantee. © Copyright 2017. All rights reserved by | » Table Leg Ideas That Match Your Home Style and Theme Colour Peter Ross Enterprises Melbourne | Website Designed by: Netwizard Design.